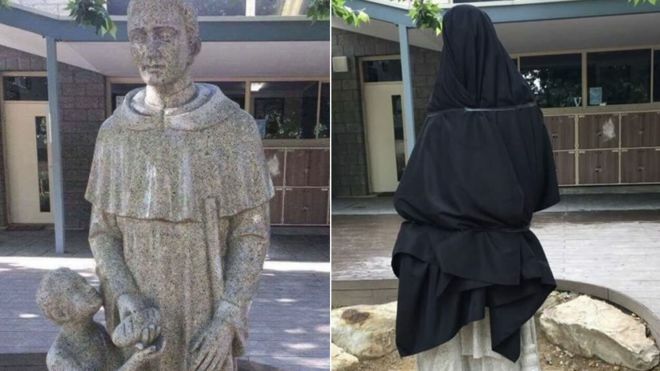 A new statue at a Catholic school in Adelaide, Australia, has been covered up and will be remodelled over issues with it being “potentially suggestive”. The statue of St Martin de Porres at Blackfriars Priory was unveiled recently and depicts the saint handing a loaf of bread to a young boy. However, the unfortunate placement of the bread raised other connotations and the school apologised for any concerns the design may have caused. Simon Cobiac, the principal, said concept plans for the statue, which was produced by a sculptor in Vietnam, were viewed and approved by the school’s executive team in May. “But upon arrival the three-dimensional statue was deemed by the executive to be potentially suggestive,” Cobiac said in a statement on Wednesday. “As a consequence, the statue was immediately covered and a local sculptor has been commissioned to re-design it. Reaction on social media ranged from incredulity that the school allowed the statue to be put up in the first place, to amusement about the cover-up in black. St Martin, a Dominican brother, was known for his tireless work for the poor and downtrodden in his native Peru during the 16th century. He was beatified by Pope Gregory XVI in 1837 and canonised by Pope John XXIII in 1962.